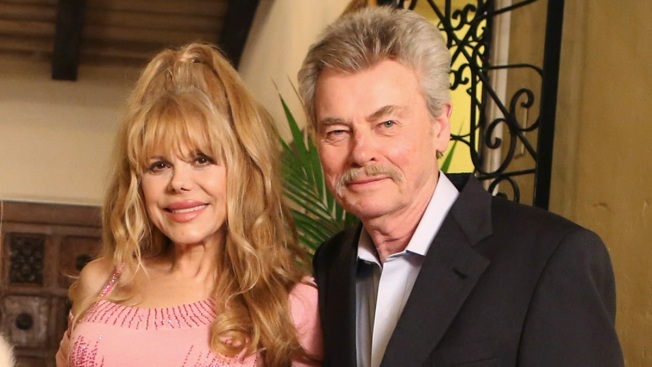 In this June 17, 2014, file photo, entertainer/musician Charo and husband Kjell Rasten are featured on "Celebrity Wife Swap." Charo is mourning the death of her husband Kjell Rasten. In a statement shared with E! News Tuesday morning, the singer and actress remembered her husband of nearly four decades with a tribute. "Yesterday, Kjell, My husband of forty years and the love of my life killed himself. There are no words to describe what we are feeling now. He was an amazing man, a great husband and the best father I could imagine to our son," Charo shared in her message to fans. "He dedicated his life to loving and supporting his family." According to Charo, Kjell developed a "rare and horrible skin disease" called Bullous Pemphigoid. He also became very depressed. "That, along with the many medications he needed to take, became too much for him, and he ended his suffering," Charo shared. "None of us had any idea this could happen to such a wonderful, kind and generous man. Please, if anyone you know and love is suffering from depression or illness, hold them close, tell them you love them with all your heart and that the world is better because they are in it. Get any help you can. Suicide is not the answer." The Los Angeles County Coroner's office confirmed to E! News that Kjell died by suicide on Monday. Charo and Kjell were married in 1978 and are parents to a son, Shel Rasten. While Kjell had a much more private life compared to his wife, he did appear in "Celebrity Wife Swap" alongside his longtime love. He also supported Charo throughout her career that included roles on "Dancing With the Stars," "The Love Boat" and more. "Thank you all so much for your love and concern," Charo concluded in her statement. "Thank you." The National Suicide Prevention Lifeline at 1-800-273-8255 provides people in distress, or those around them, with 24-hour support. The Crisis Text Line allows people to text 'Home' to 741-741 to connect with crisis counselors.